Iraqi soldiers flash victory signs after regaining control of the Ramadi Stadium and the neighboring al-Bugleeb area, Oct. 6, 2015. Russia on Wednesday shot 26 long-range cruise missiles from its navy ships in the Caspian Sea across Iraqi airspace to hit both anti-government and Islamic State targets in Syria, further ramping up its fierce bombing campaign there. "The kind of military strategy that Russia seems to be pursuing right now is not at all likely to be successful in advancing their interests inside of Syria," said White House spokesman Josh Earnest. "In fact, we actually think that the strategy that Russia is now pursuing military is likely to be counterproductive." Defense officials said Washington is working to ensure that there is not "an unsafe separation between aircraft," and called on Iraq to check its airspace. But :it’s happened," said Pentagon spokesman Capt. Jeff Davis. "We do urge our partners, Iraq among them, to be skeptical about these things, to ask hard questions about what’s going through their air space," said Davis. 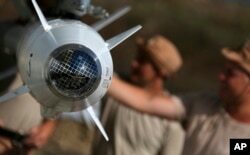 FILE – Russian military support crew inspect missiles for their jet at an air base in Hmeimim, Syria, in this photo taken from the Russian Defense Ministry’s official website Oct. 6, 2015. Baghdad's pro-Iranian government has welcomed the current intelligence-sharing partnership. "We need to develop cooperation with these countries for the defense of Iraq and to protect our people," said Baghdad government spokesman Saad Hadisi. One leading Shi'ite politician went even further. "In the upcoming few days or weeks, I think Iraq will be forced to ask Russia to launch air strikes, and that depends on their success in Syria," Hakim al-Zamili told Reuters in an interview. "The recent suggestions that Iraq should join the quartet coalition consisting of Syria, Iran, Russia and Iraq are unofficial," Mollah told VOA. "These are comments made by the commanders of the Shi'ite militia in their talks with the Iranians, Syrians and Russians," he said. "Any such agreement must be coordinated with Iraqi government and international coalition joint task force. We won’t approve such a deal." "We do hope that all countries interested in peace and stability will be unanimously fighting ISIS and not to use the fight of ISIS as a pretext for geopolitical rivalries, or to use it to weaken their rivals or their competitors," said Hemn Hawrami, foreign relations chief of Kurdistan's ruling KDP party.